I hope everyone had a great Fourth of July weekend and week! Things have been a little off around here because of the holiday falling on a Tuesday, family and friends are still in town, and motivation is lacking when your week starts on a Wednesday. But, I'm so happy to have taken some time away from social media and the blog to just relax, eat really great food (thank you Chad), and fully enjoy our amazing company. As I made my way back into the kitchen this morning, the only thing I had on my mind was cherries. Our cherries are finally on sale at most markets here in Ohio, so I have taken full advantage and filled our fridge! Along with fresh peaches, cherries are one of my favorite summertime fruits. They are just so sweet, refreshing, and completely addicting to eat! As I was getting my breakfast together this morning, I couldn't help but think how delicious these tangy gems would be in a baked oatmeal. And then I also thought about how long that would take in the morning, and nobody has time for that! 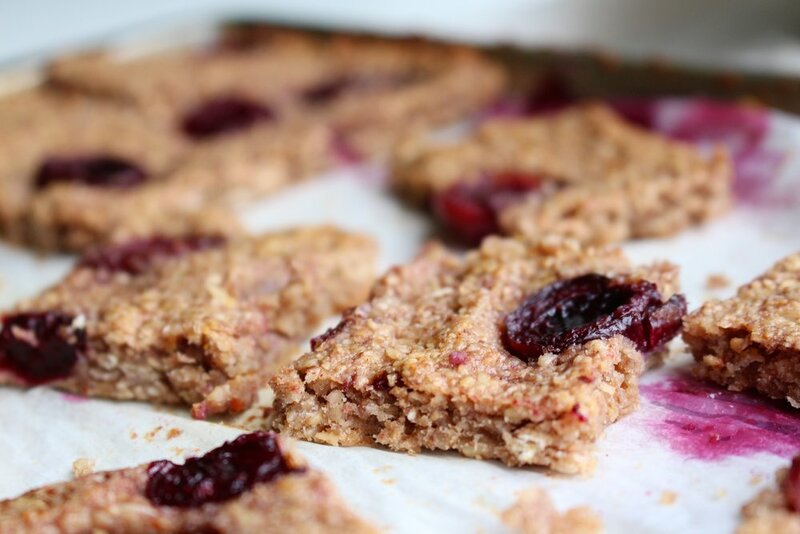 Luckily, baked oatmeal makes for the perfect breakfast bars! I prepared this recipe in under fifteen minutes, baked for another fifteen minutes, and had enough breakfast bars to go around. 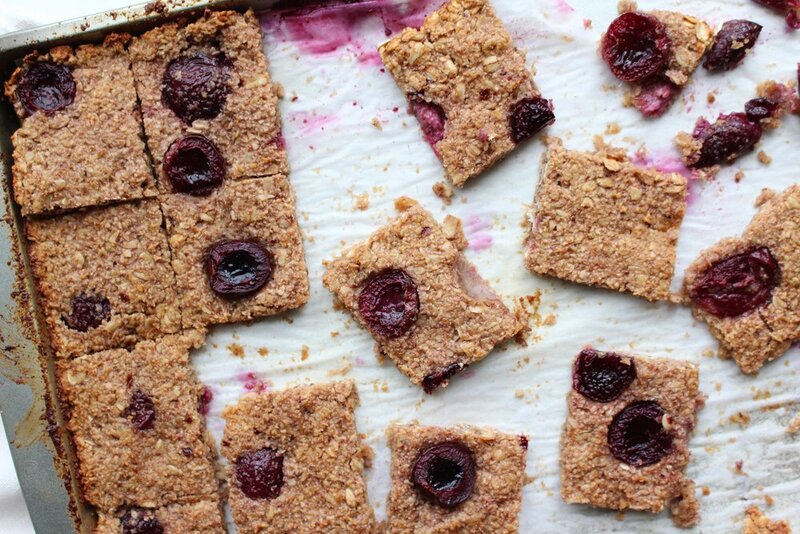 All you need is a food processor and a little bit of time to make these incredible, filling, and nutritious breakfast bars! So let's get to it! 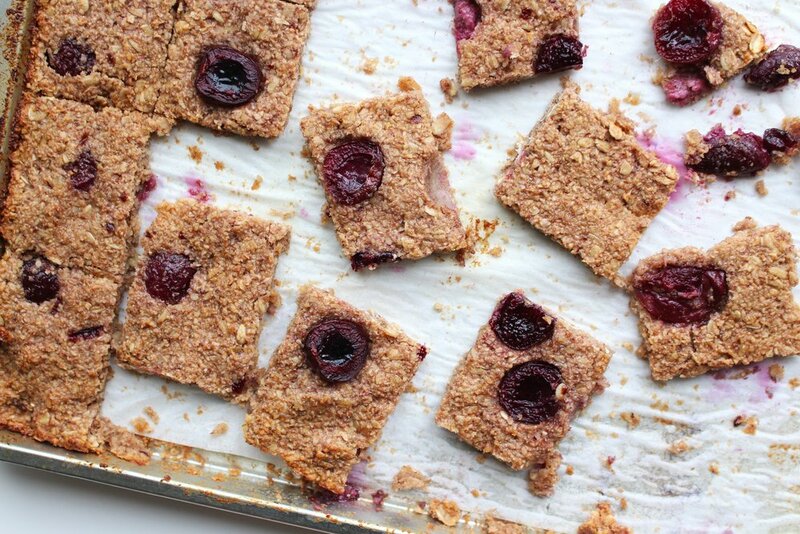 Using a food processor, combine 1 cup of cherries (leaving 1/2 cup for later use), 1 cup cashews, and 1 cup rolled oats (leaving 1/2 cup for later use). Next add in your honey, nut butter, flax meal, coconut oil, and cinnamon. Blend until evenly combined and cashews are completely broken up. Transfer into a large mixing bowl and add in the remaining 1/2 cups of cherries and oats. Gently fold making sure not to squish the cherries. Spread the bar batter evenly onto a parchment lined 8x8 baking pan or small baking sheet. Bake for 12-15 minutes at 350ºF, or until the edges begin to turn golden in color. Let the bars completely cool before cutting into them! 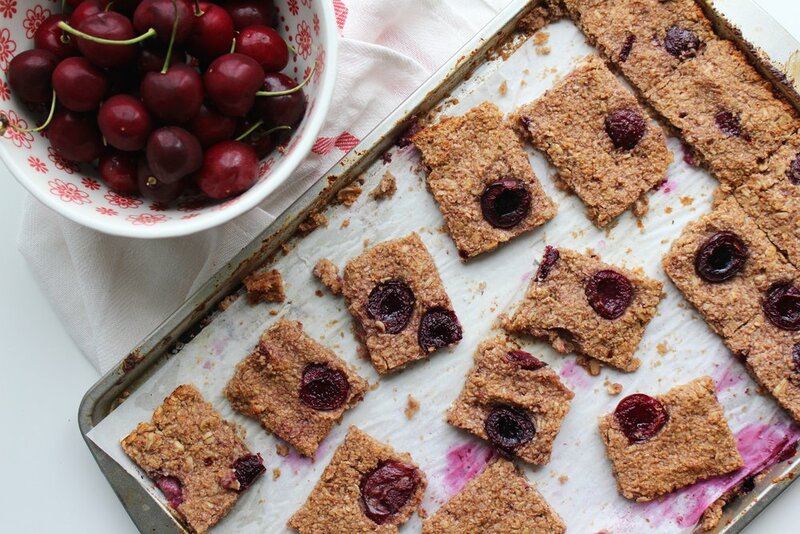 *I let mine sit in the fridge for almost 2 hours to ensure the cherries and baked oatmeal were solidified. Once chilled, cut and enjoy!